Great news! S&R is holding another wave of Members' Treat this September, and it will be a HUGE one. Each year, different items are marked with a huge discount, and for this year, let's have our fingers crossed for the items under our watchlist to be on sale! My favorite item in S&R is the Smartfood White Cheddar Popcorn, and I really do hope that this will be on sale. If it does, I'll be hoarding a lot of it! Imagine all the movie nights that will be made "cheesier" and delightful with a white cheddar popcorn to munch. Another item that I'm hoping to be on sale is the Ben & Jerry Ice Cream particularly the Cookie Dough flavor, although any other flavors will do. How about you? What items are you hoping to be on sale? 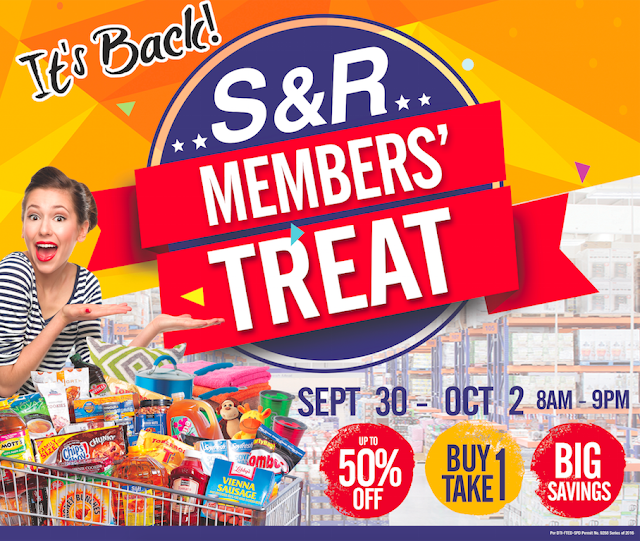 This grand S&R Members' Treat will run from September 30 to October 2, 2016. So make sure to be there to catch all the great sale in the S&R branch nearest you!